The Oscar Pistorius murder trial resumed on Monday with emotional accounts from the first neighbors to arrive on the scene after the athlete killed his girlfriend Reeva Steenkamp. After a two-week recess, the defense called Johan Stander – who lived in the same gated community as the double-amputee Olympian. Stander arrived on the scene with his daughter shortly after the 29-year-old model was fatally shot. Pistorius claims he mistook Steenkamp for a burglar and that the shooting was an accident but prosecutors allege her killing was premeditated. "He was praying to God the whole time. 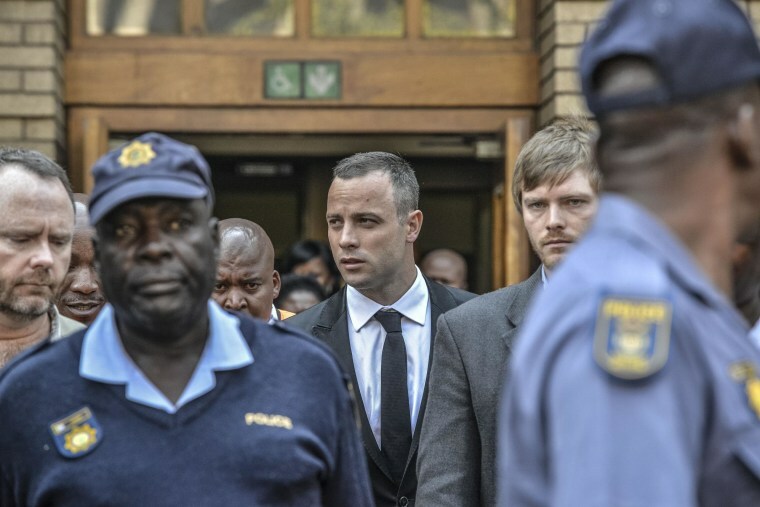 He kept on begging Reeva to just stay with him and not to leave him"
Stander told the court Monday that Pistorius phoned him early on Feb. 14, 2013 and begged him to come over. Stander said he and his daughter arrived at Pistorius’ home to find the athlete carrying Steenkamp down the stairs in his arms. The defense asked Stander to testify about crime in the community where he and Pistorius lived, an apparent attempt to demonstrate that the athlete had good reason to fear an intruder. But upon cross-examination, Stander was pushed by prosecutor Gerrie Nel to acknowledge that he had not burglar-proofed his home. Reeva Steenkamp was fatally shot at Oscar Pistorius' home on Valentine's Day last year. The Olympian denies premeditated murder. Stander’s daughter, Carice Viljoen, testified she recalled seeing a security guard outside when they arrived and "blood everywhere" when she walked inside the house. Pistorius sat with his head bowed and his hands covering his eyes as Viljoen tearfully described running upstairs to grab towels and trying "frantically" to stop the bleeding as she and the runner knelt next to the law graduate's body. Viljoen said she feared Pistorius might shoot himself when at one point he went upstairs to fetch Steenkamp's identification documents for paramedics. The defense has sought to prove that the crime scene may have been contaminated by careless police work. In an apparent attempt to cast doubt on that theory, the prosecution on Monday pressed Viljoen on whether she at any point was unaccompanied in the runner's bedroom. She confirmed that a police officer was present when she and Pistorius’s sister went upstairs to pack a bag of clothes for Pistorius. At some point in the day Steenkamp’s purse was removed from the scene by the runner’s sister, Aimee, Viljoen confirmed. She said that she and Aimee Pistorius had “wanted to keep it safe” for Steenkamp’s mother. “It was a hectic day,” she added. After Stander and Viljoen's testimony the trial - now in its seventh week - adjourned for the day.